This beautifully bound anniversary journal commemorates 1st through 60th anniversaries in timeless style. Whether your wedding was a black tie affair or a barefoot beach celebration, it was one of the most memorable days of your life that will stay with you for decades to come. 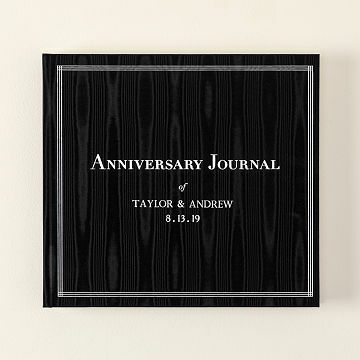 So commemorate the date in timeless style with our gorgeously designed and crafted anniversary journal. Custom pages record memories of your 1st to 60th anniversaries through prompts to guide romantic reflection and mutual aspirations (how you celebrated, favorite things, memorable moments), while a photo page illustrates each section and elegant envelopes interspersed every decade provide a place for additional mementos of your time together. Each section also includes the traditional and modern symbols for that year--from paper to diamond. The classic design, fine quality paper, and sumptuous black silk moire binding with shimmering, foil stamped cover and matching storage box make this a fitting package for the precious record of the days you celebrate your union. The personalized journal also includes your names imprinted on the cover, creating an instant heirloom. Write your anniversary date on the title page, or choose to add it below your names on the cover for an even more distinctive book. Printed and smyth sewn in Clarksville, Tennessee; box made in New Jersey. Check out the The Anniversary Journal. Definitely planning on buying again! This journal is beautiful. I have purchased 2 as wedding shower gifts and both times the bride thought it was the best idea. Now that I have my own children getting married this year it is first thing that I purchased for them. This is perfect for every newlywed! Defnitely well made and excellent quality. I was struggling to find a first anniversary gift for my husband- something thoughtful and something that would last, but also something paper! This fit the bill and is even better than I thought it would be. High quality, beautifully bound book that I know we will have forever. My husband will love it! Looks and feel like it will stand the test of time. A symbol of our marraige itself. The perfect momento to look back on for decades. This was the couples 2nd marriage and they had everything. They requested no gifts but I felt this Personalized Anniversary Journal was perfect. As we all grow older, we realize its the times we share with the people we love that has the most value and this journal is a way to remember those times. This is absolutely beautiful in person! This journal is so well made & put together. It even has a pouch for every 10th year anniversary to put away photos from the day! This is my favorite wedding gift! This was a gift for my future daughter in law at her bridle shower. Everyone loved it and asked where I got it. It has awesome features and contents. It was expensive but worth it!